There’s a small period of time in-between the fall works and the middle of winter when you’re feeding cows twenty-four-seven; when you don’t have a whole lot to do on the place. The calves have been shipped and the cows are turned out. Well we are now past that time and our cows got brought home a little early this year. We keep our cows in relatively small creek bottom pastures, where they’ll have plenty of trees and brush for cover during calving season. Everyday they get a certain number of round hay bales depending on how many cows in the lot and how much they’re eating at this time of the year. We don’t ride nearly as much as usual this time of year cause there’s not a whole lot to be done horseback or otherwise until calving season starts but we do get some rides put on some colts occasionally; if we get the chance. Another common occurrence this time of year is weaning our baby colts from the brood mares… which we did the other day. We’ve been keeping the mare bunch turned out on our cut hay meadows until the day we got them into the corrals by the barn and worked on sorting the babies off their mothers. With the whole bunch run into a big pen inside the barn, Dad worked two or more at a time towards me (running the gate) and soon we had a clean sort- with only a few mixups that eventually got worked out. With the mares sorted, we turned them into a lot across the fence from the babies so they could still touch noses if they needed to. The babies are still in the corrals getting fed and more gentle everyday, while the mares have pretty much realized life is much easier without an obnoxious colt constantly bugging you! So in short, winter life isn’t especially exciting for a few more months but we’ll get to that soon enough! 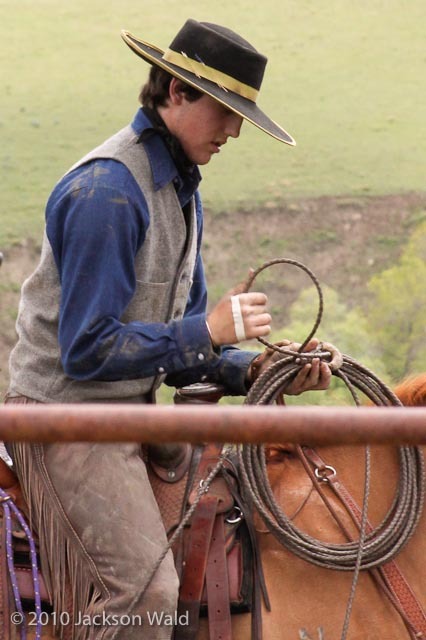 Comments for "Weaning Colts and Winter Work"
I’ve been keeping up with your entries, and I find them a pleasure to read, as well as informative. I myself have experience operating a ranch outfit, but in slightly different climate conditions,(FYI i’m in Texas.) I’m not familiar with Lodge Grass, Montana. I’m awfully curious as to what type of rangeland the Wald Ranch resides on. I’m highly involved in Range management and was wondering what plants, or “forage”, make up a routine grazing system for your cattle when they’re not on hay or suppliments. If you are familiar with the plants in your cow’s daily diet, I would be more than happy to hear of them, for I am only familiar with my Texas grasses and plants. In short, I’m doing a research paper for my FFA, SAEP. report. It’s focused on range, cattle, and their diets in contrast to the cattle in your area. . When ever it’s convienent for you, I’d appreciate it if you’d write back. Jake Wald on January 04, 2011 Jennifer, thanks for keeping up with my writing! I appreciate the questions too. Well, Lodge Grass is located in the southeastern part of Montana, roughly 60 miles north of Sheridan, Wyoming. Jennifer Parton on January 12, 2011 Thanks for responding, I can now progress with my report. Please inform me as much as your time can allow, I’ll need a bit more information later on. If possible e-mail me. Thanks.